Egyptian Prime Minister Essam Sharaf Sunday praised militant supporters of crowned Cairo soccer club Al Ahly FC for their rare cooperation with security forces during this weekend’s African Champions League match against Esperance Sportive de Tunis. The joint effort constitutes a watershed in relations between the highly politicized, violence prone fans and security forces, who fought years of weekly battles in stadiums and clashed on Cairo’s Tahrir Square early this year during mass anti-government protests that forced President Hosni Mubarak to resign after 30 years in office. The fan group, Ultras Ahlawy, clashed again earlier this month, with security forces, long viewed as Mr. Mubarak’s henchmen, during a domestic soccer match. Some 130 people were wounded, including 45 security personnel. The ultras were also part of mass protests a week ago against Egypt’s military rulers, who succeeded Mr. Mubarak with a promise to lead the country to democracy, in which three people were killed, more than 1,000 wounded and protesters stormed the Israeli embassy in Cairo. “I salute the wise fans of Ahli for being fully disciplined in supporting their team before the Tunisian brothers, who also gave a great example in co-operating with security. I hope that sportsmanship remains principal in all sports events in Egypt,” Mr. Sharaf said on his Facebook page. Mr. Sharaf’s praise was designed to build bridges with the ultras who played a key role in the toppling of Mr. Mubarak and subsequent anti-government protests. It constitutes an effort to exploit public criticism of the violence often exercised by the militants. A 1:1 draw with Esperance put an end to Al Ahly’s hopes of advancing in the tournament in a match attended by some 50,000 Ultras Ahlawy supporters. 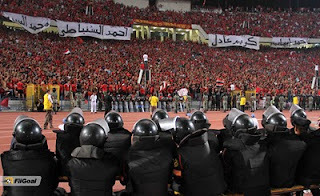 In an attempt to repair strained relations between the ultras and security forces, law enforcement officials before the match agreed that the ultras would take responsibility for keeping their members in check during the match. In return, the ultras called on their members in the days before the match to refrain from violence and the throwing of bottles and other objects onto the pitch. They also agreed not to bring flares, fireworks and smoke guns into the stadium. Ultras gave the Ahly team a standing ovation at the end of the match even though they had failed to secure their place in the African cup. 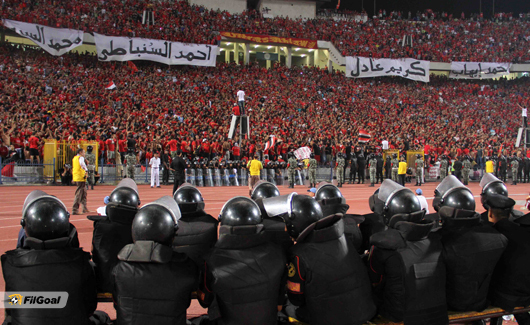 The concessionary attitude of the ultras was agreed in a meeting with Al Ahly chairman Hassan Hamdy. James M. Dorsey is a senior fellow at Nanyang Technological University's S. Rajaratnam School of International Studies in Singapore and the author of the blog,The Turbulent World of Middle East Soccer.